NOSOVICE, Czech Republic -- Located in the industrial zone of Nosovice, a four-hour train ride from the Czech capital of Prague, Hyundai Motor’s plant is where the carmaker’s popular hatchback and sports utility vehicle series are born. On a 2 square-kilometer plot, the plant has full auto manufacturing capabilities, and is partly operated by robots. Considering the massive size of the plant, there are not many workers around. Instead robot arms move endlessly to weld steel components. Built in 2008, it is one of the youngest plants in Hyundai’s global network, and holds a relatively high automation rate. “We have 367 robots for welding jobs, to run an entirely automated process,” an official who led the press tour on Friday. The high automation rate means high production rate. As of August, the plant manufactured 2.75 million units in total since its establishment in 2008. By April, it is expected to surpass the 3 million mark. Last year, the plant manufactured 356,700 units, exceeding its annual production capacity of 330,000 units a year. Also behind the high production rate is highly skilled local workers. It hires 3,200 local workers and works with 19 contractors nearby. The plant, into which the South Korean carmaker poured around 1.12 billion euros 10 years ago, the biggest foreign investment by that time, has grown as a key driver of the company’s Europe expansion, said Yang Dong-hwan, president at Hyundai Motor Manufacturing Czech. As of last year, cars made in the Czech Republic were exported to 63 countries around the world including 27 EU member nations. Plants there produce half of the cars Hyundai sells in EU markets, about half a million. The carmaker is expected to reach the 1 million sales mark this year. In the Czech Republic, Hyundai is ranked third in terms of market dominance, following Skoda and Volkswagen, and second in production capacity. 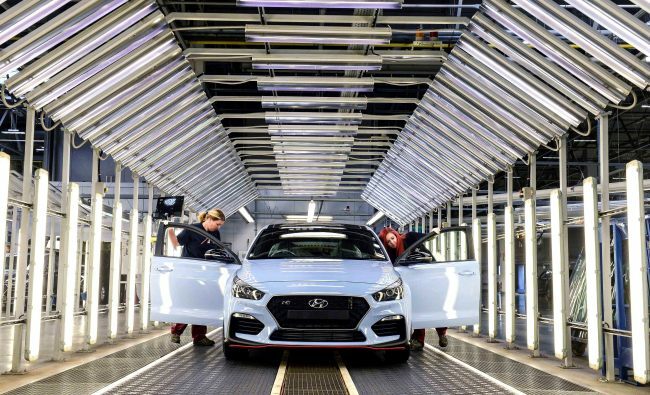 Not just being a manufacturing base for Hyundai, the Czech plant is where the carmaker’s high performance hatchback, i30 N, is born. The plant has professional workers testing quality and safety of i30 N. After an intensive series of tests, i30 Ns are exported to 31 countries. It takes around three to six months to have the high functioning vehicle delivered, the company said. Hyundai as an innovative and green car brand has been gaining recognition in Europe, home to traditional players that hold more than 100 years of history, according to officials.